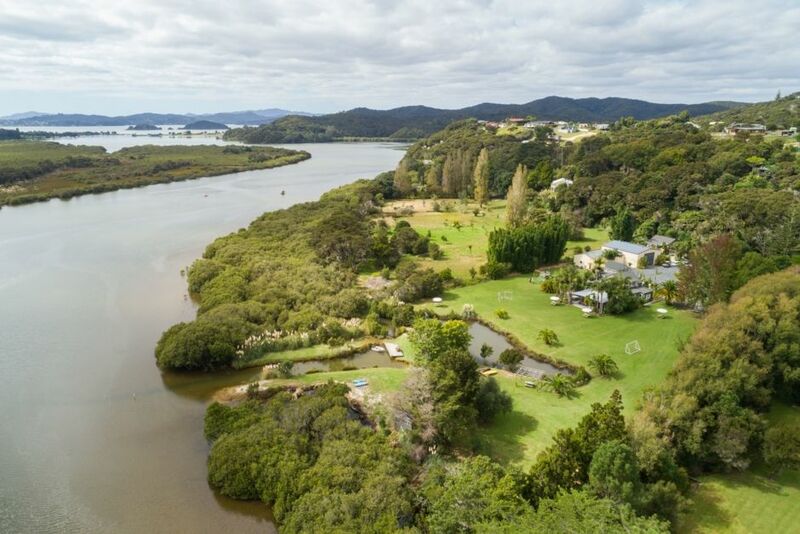 A peaceful setting at the Waitangi River with amazing privacy yet only 5 minutes away from Paihia. Relax in the alfresco dining and lounge area, play sports on the lawn, explore the river by kayak, launch your boat from the private tidal ramp or hire our kayaks & 12ft dingy with motor to go for a play, check out the Haruru waterfalls or fish in the stunning Bay of Islands or just chill out on the couch watch Sky TV and enjoy the fireplace. We have it all on offer and so much more..
Our big lawn also offers plenty of room to allow for a marquee for functions, it can be a perfect setting for a wedding, birthday etc..
Special conditions & fees apply based on size of event & number of visitors attending. This place is for the exclusive use of guests paying to stay at the lodge and not to be used as a BBQ gathering/hangout meeting place for others who you may know on holiday in the Bay of Islands. No parties allowed without prior permission regardless of how small or large. Special Events : maybe allowed POA fees conditions apply. the river access is tidal Private boat ramp, jetty, kayaks & 12ft dingy with motor for hire. The house feels completely secluded, when it is only 5min driving from Paihia's town centre. We were a group of 10 friends and there's plenty of space for us to not be on each other's backs all the time! The outdoor area is absolutely stunning, whether you want to play, relax or organise a big BBQ. There is also everything you need inside, and the bedrooms are all big. It was raining all weekend but we ended up playing games inside, and it was perfect. Karl was very easy to communicate with, and everything went very smoothly. Highly recommended! Great guests, very respectful & left the place clean & tidy, much appreciated, welcome back again anytime. Fantastic property with all the amenities, great outdoor entertainment space for large groups and a beautiful landscaped garden finishing off with the river. What else do you want., We had a great time. lots of water activities, kayaking, jets ski, parasailing, fishing charters to scenic cruisers, dolphin watching, island hoping, all in calm protected waters.